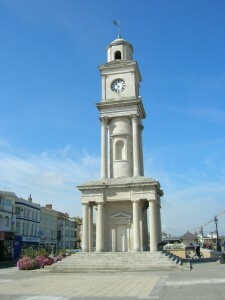 The Clock Tower, Herne Bay the earliest free-standing clock tower in the World. In the September issue of Newslink (the MSA GB members’ monthly magazine) Tony Phillips, MSA GB Greater London, discussed in his column the driving test trial. One section stated: ‘Upon entering a side road which is a two-way road but is heavily parked on both sides with no immediate passing places, you see a removal van stopped in the middle of the road and just about to commence loading. What would you do?’ He was suggesting that the best course of action would be to do a manoeuvre you wouldn’t usually recommend, mainly reversing out of a side road on to a busy main road. Otherwise, you could be sat there all day! In my mind’s eye I was immediately transported back to Arkley Road in Herne Bay, Kent on a pleasant spring day – the day I took my own driving test. I had just turned left off King’s Road, down Stanley Road, and as I passed King’s Road School, where I had been a pupil, I was asked to turn left into Arkley Road.